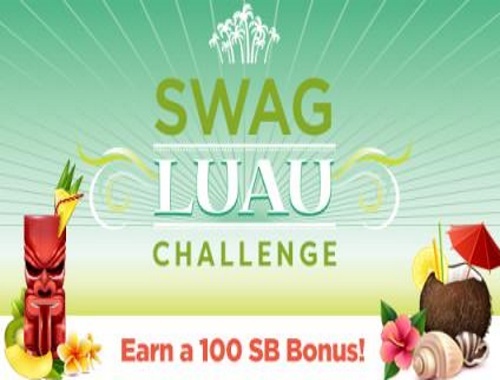 Put on your lei, enjoy some Slack-key guitar, and get ready to eat some Kalua Pork, because Swagbucks is holding a Luau Team Challenge to help you earn free gift cards! For those of you who don't know what Swagbucks is, it's a website where you can earn cash back on everyday tasks you do online like shopping, answering surveys, discovering deals, and watching videos. You can even earn for searching the web! If you've never tried Swagbucks before because you didn't know where to begin, their Team Challenges are a great way to learn the ropes! The challenge, begins Monday, August 14at 8am PT, but you can pre-register starting on Friday, August 11! 2. Starting August 14 at 8am PDT, in addition to earning SB you'll contribute points to your teams total as you complete different activities on Swagbucks. Not only that, but if you sign up under me this month and earn 300 SB before September 1st, you'll get a 300 SB bonus! Members of the 1st place team will receive a 100 SB Swag Up Rebate, members of the 2nd place team will receive a 50 SB Swag Up Rebate, and members of the 3rd place team will receive a 30 SB Swag Up Rebate. Your SB Swag Up Rebate will be made available on Friday, August 18 at 2pm PT and will expire on Thursday, August 31 at 11:59pm PT.